Pomona, CA - The New Way® Sidewinder was recently featured in Mack Truck's monthly magazine, The Bulldog. The "Big Story" in the magazine highlights the success the Sidewinder CNG truck is enjoying in Pomona, Calif. Pomona City Manager Howard Morris said the transition to the natural gas-powered trucks has been a smooth one and everyone from the drivers to mechanics to city council members are impressed by the truck's performance. 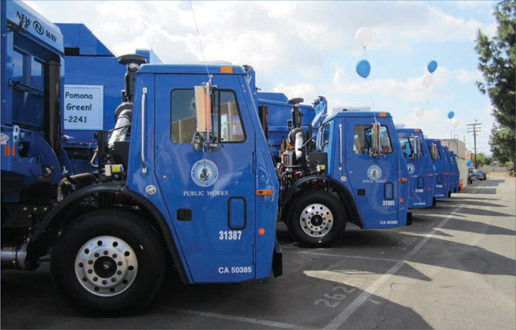 The city transitioned their entire fleet last October, purchasing 22 New Way® Sidewinder CNG models based on the positive environmental impact and financial savings that CNG will provide for the community.